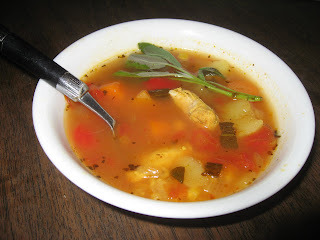 I came up with this recipe last year in the middle of winter - it's a great meal-in-one, hearty and comforting soup. It's got chicken and rice in it so it's very filling too. I also make it in large batches and freeze it so it lasts quite a while (it's really convenient - I can just head some up for dinner when I get back from work). So, I decided that it was time to make a batch this year, since it's been getting pretty chilly lately (and I'm also feeling lazy :) ). But, as I said in my welcome post, I tend to never make the same dish the same way twice. Below is the original recipe I settled on last year. I'll mention here though the modifications I made this time around. Instead of 20 cups of water I put in something like 24. I also added some torn fresh sage leaves, and I used brown rice instead of white rice. I only happened to have 1 lb. of chicken on hand, which didn't turn out so well - it feels like there just isn't enough chicken for as many servings. I didn't have boullion cubes on hand, so I left those out and added a bit more chicken soup mix. Finally, I had the last of the sweet potatoes to use up, so I substituted a couple of them for the regular potatoes. The only change of these I would keep is the sage - too much water and the wrong kind of rice made the soup too watery - it's supposed to be a nice thick, hearty soup (but not quite porridge). The lack of chicken and boullion cubes I think probably cut back on the chicken flavor of the soup, which was unfortunate. The sweet potatoes were not bad, but I still prefer the taste of regular potatoes in this soup. Also, note the addition of sugar to the soup - that was something I decided to do after deciding my soup was overpoweringly spicy (even though I like it that way). This batch came out a little more watery than it's supposed to...oh well. Note: These amounts are estimates. You are better off judging how much to put in by eye based on how much soup you are making. 1. Preheat oven to 400 degrees. Slice peppers in half, clean out the seeds, and place on a baking sheet, along with garlic. Drizzle some olive oil on top of the peppers and garlic. Sprinkle salt and pepper on top. 2. Roast peppers and garlic in the oven for 15-20 minutes until peppers start to brown a little bit. Finish with 3-5 minutes under the broiler till the pepper skin begins to char and bubble. Set aside to cool. 3. Sauté onions in a skillet until they start to soften. Add chicken to skillet and lightly brown along with turmeric, coriander, salt and pepper. 4. Peel the skin off from the cooled roasted red peppers and cut them up – about a 1 inch dice. Dump the peppers & garlic in a large (I use a 10 quart) stockpot, along with chicken & onions. Add carrots and crushed tomatoes. 5. Add sugar, boullion cubes, soup mix, chicken broth, water, followed by herbs – thyme, basil, parsley, sage, crushed red pepper, bay leaves, salt and pepper. Remember, judge how much of herbs to add according to how much soup you are making. Mix well and bring to a boil. Once the soup boils, reduce to a simmer. 6. After 45 minutes, add potatoes and corn. 7. After another 45 minutes, add rice and let it continue simmering until the rice is fully cooked (about 10-15 minutes). Once the rice is cooked, turn off the flame and you are done! 3 WW points per serving. Lots of good flavors going on here. We like to fry our corn in butter first...but roasting them along with the red peppers would help caramelize them and make them sweeter. Welcome to The Kosher Chef!